Baubles Mod can enable other mods to add additional inventory slots to a character. It’s an useful addon mod and api. Without other mods installed, the Baubles Mod 1.11.2 adds 4 new inventory slots. These slots are used for a belt item, an amulet, and 2 rings. Since vanilla Minecraft does not have any rings, belts, or amulets, the Baubles Mod are useless until you have other mods installed that work with the Baubles Mod. Opening the Baubles Mod inventory uses different buttons than vanilla Minecraft. However, you can change the inventory button from the E button to the B button, so that the inventory opens the Baubles’ inventory. 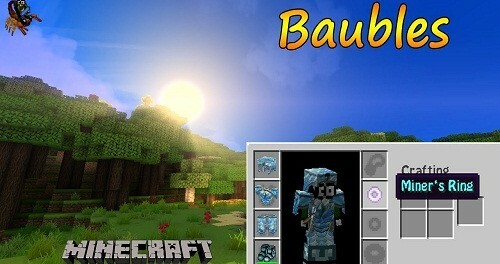 Download the Baubles Mod 1.11.2.